The most commonly used Olympics medals table is based on the number of gold medals and it puts China top and Great Britain third. But what happens if other factors are taken into account? 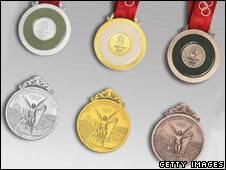 Much has been made of the Great Britain team's lofty position in third place in the Olympics medals table. That is based on the number of gold medals, with the number of silver and bronze medals only counting when two countries have the same number of golds. This system counts against countries like France which, as of 1000 BST on Friday morning, had enjoyed 32 podium finishes but only a handful of wins. Maybe with this in mind, and half an eye on China, media in the US have been publishing a table of total medals won, regardless of colour, and that puts the US top. Sources include the CIA Factbook and the World Bank.